Выставка тюнинга SEMA Show в Лас-Вегасе в 2018 году соберёт как минимум 3 доработанных седана Volkswagen Jetta, которые будут представлены на стенде марки. Volkswagen примет участие в грядущем тюнинг-шоу SEMA — в Лас-Вегас марка привезёт сразу три новых седана Jetta, которые доработаны Air Design USA, H&R и Джейми Орром. Каждый автомобиль выдержан в собственном стиле и отражает вкусы его создателя. Версия от Air Design USA построена на базе Volkswagen Jetta SEL. Машина стилизована под модели Volkswagen 1980-90-х годов. Седан получил аккуратный задний спойлер, багажник на крышу, а также красно-оранжево-жёлтую графику, 19-дюймовые колёса TSW Hockenheim S с резиной Falken Azenis FK510, заниженную подвеску Eibach и красные тормозные суппорта. Салон получил отделку чёрной и коричневой кожей. Более агрессивный дизайн у Volkswagen Jetta R-Line работы H&R Special Springs. Этот седан также получил обвес Air Design USA, который дополняет ярко-оранжевую окраску с контрастной серебристой графикой, новый спойлер, койловеры H&R и 19-дюймовые колёса Rotiform BUC с покрышками Pirelli P Zero, а также оранжевые тормозные суппорта. Но самым эпатажным стал Volkswagen Jetta S от Джейми Орра. Модель с 6-ступенчатой механической коробкой передач получила напечатанный на 3D-принтере боди-кит ECS Tuning, гигантский задний спойлер и очень агрессивное занижение. 20-дюймовые диски Work Emotion T5R 2P обуты в шины Delinte DS8, которые дебютируют на этом шоу-каре. Также седан оснащён койловерами KW Clubsport, тормозами ECS Tuning с суппортами Brembo спереди и суппортами от Golf R сзади. Volkswagen рассказал только о внешнем тюнинге моделей, не сообщив, что будет под капотом доработанных Jetta. Можно предположить, что речь идёт о 147-сильным 1,4-литровых турбомоторах. Volkswagen of America, Inc. is pleased to announce that the Volkswagen Jetta has been chosen by three top automotive builders and customizers as a platform to showcase parts, equipment and build potential at the Specialty Equipment Market Association (SEMA) Show® in Las Vegas, between October 30 and November 2. The sedan’s large, more dynamic proportions have made it an appealing car to highlight both cosmetic and performance-based parts and accessories to attendees. “Straight from the factory, the seventh-generation Jetta’s bold new design grabs people’s attention,” says Robert Gal, Senior Manager, Performance & Accessories, Volkswagen Sales & Marketing. “The fact that this group of top tuners and customizers chose it as a canvas for their offerings and creativity is further testament to its appeal." The following Jetta builds will be on display from October 30th to November 2nd at various locations in and around the Las Vegas Convention Center, Las Vegas, Nevada. Built to highlight the aftermarket suspension offerings from H&R Special Springs, this Jetta R-Line has been lowered via H&R Street Performance Coil Overs and Trak+ wheel spacers. Perching the car on 19 x 8.5-inch Rotiform BUC wheels wrapped in Pirelli P Zero tires has cleared the way for upgraded front performance brake calipers, color-matched to the Habanero Orange factory paint, and 13.4-in rotors. Inspired by Jetta/Golf accessories from the 1980s and 90s, Air Design USA’s Jetta SEL build pays homage to the aftermarket’s embrace of the second-generation sedan and hatch. Nineteen-inch TSW Hockenheim S wheels, shod with Falken Azenis FK510 tires, are a modern redesign of the 90s-era DTM-inspired Hockenheim wheel. 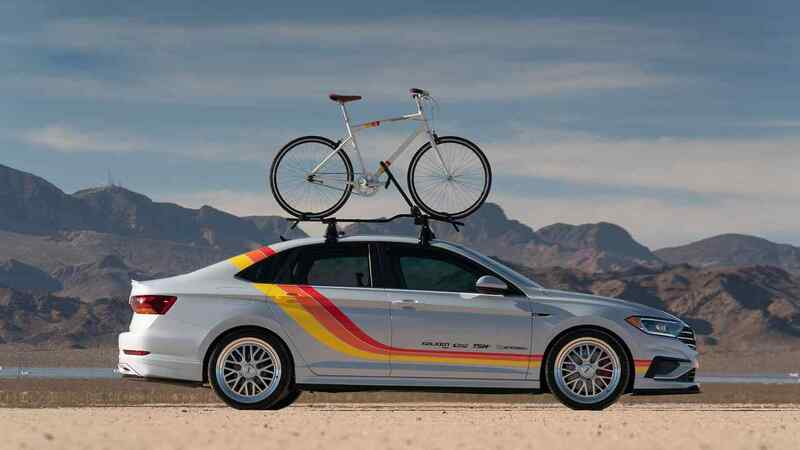 An Air Design USA body kit with rear lip spoiler is complimented by vintage look tri-color graphics that echo onto a roof-mounted bicycle, attached with Volkswagen Accessories roof bars and upright bicycle rack. A lowered stance is achieved with EIBACH® Progressive Rate Lowering Springs and draws attention to front performance brake calipers, painted in GLI red. Inside, two-tone custom cognac and black colored seating surfaces with matching door cards and steering wheel complete the retro look. The car also sports a full suite of Volkswagen Comfort & Protection Accessories including MoJoMats® carpet floor mats, MuddyBuddy™ Trunk Liner, Bumperdillo® rear bumper protection, and pop-in sunshades. Volkswagen enthusiast Jamie Orr has a history of cutting-edge builds, and has now taken his talents to a White Silver Jetta S with six-speed manual transmission. Lowered on KW Clubsport coil-overs that feature remote reservoirs and three-way adjustable damping, the aggressive stance highlights a set of 20-inch Work Emotion T5R 2P wheels. 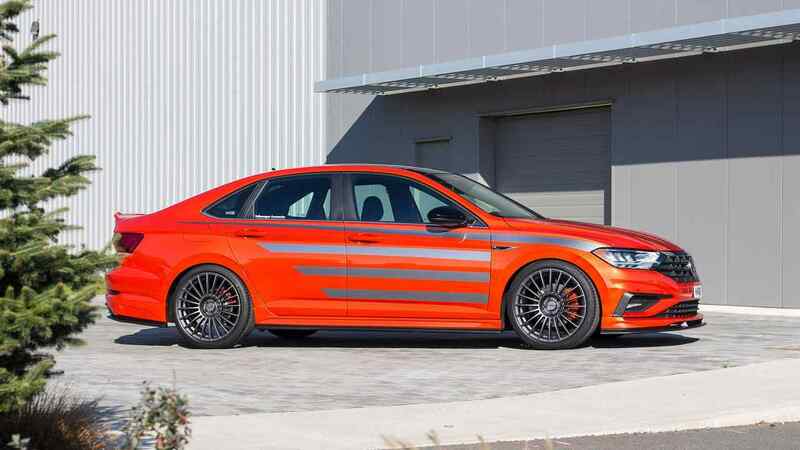 Wrapped in Delinte DS8 tires, the wheels make their world debut on the car, and showcase ECS Tuning brake rotors with Brembo six-piston calipers up front and Golf R calipers/carriers at the rear.